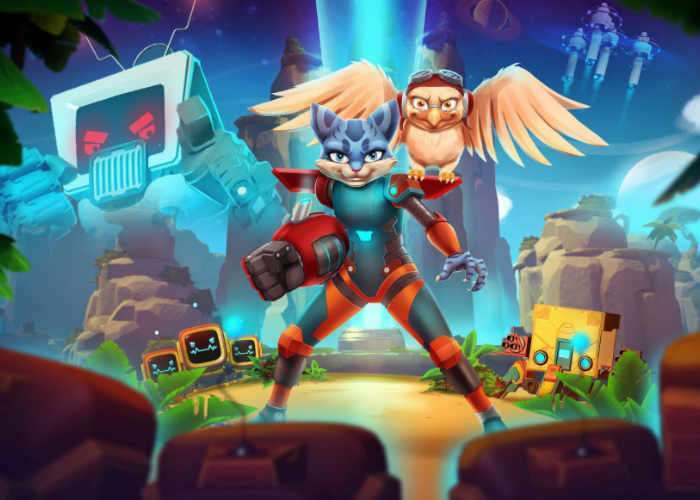 Those of you that enjoy 3D platforming games will be interested to know that Skylar & Plux: Adventure On Clover Island will be launching this Friday on May 19th, 2017 and will be available to play on PC, Xbox One and PlayStation 4. Providing an homage to the 3D platformers combined with an action-packed adventure which allows you to collect gadgets to help you explore the game’s world further. Check out the launch trailer below to see more of what you can expect from this 3D platform game. The vibrant 3D platformer pays homage to the beloved platform genre of the previous decade, combining classic gameplay, playful gadgets, and a lighthearted story, set in a gorgeous world reminiscent of childhood adventures. The game takes place in the exotic Clover Island, with lush greenery and colourful landscapes. Our main heroine, Skylar Lynxe, a snow cat with a mysterious robotic arm, and Plux Owlsley, her trusty sidekick, have to stop an evil industrialist who plans to conquer Clover Island. Your mission is simple: you must fight your way across four different environments and a dozen levels, taking on boss battles, volcanoes and space, using a wide range of upgradable gadgets and weapons to save the island from destruction. Game mechanics include all the moves you’d expect from a standard platformer. You can jump, double-jump and spin-attack. As you progress through the stages, you will be able to unlock a jetpack which lets you jump further and higher, as well as many other gadgets. Aside from those pure platforming mechanics you will find puzzle elements as well that are more traditionally found in adventure games.